This week at the loft we helped many people answer this question! The clear aligners along with Propel are our favorite combination for patients ready to straighten their smile. We have seen so many more patients move forward with treatment knowing that time is valuable and much less time is spent in Invisalign now. The patient shown below had 13 aligners for her treatment. That is 26 weeks of treatment! 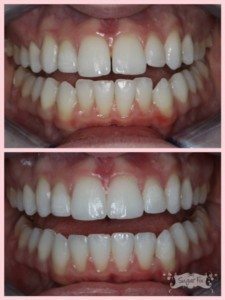 Instead of having to wear each aligner for 2 weeks, she wore each aligner for only 3 days! That is only 39 days of total Invisalign treatment with amazing results! With a wedding on the horizon, our patient was so happy to have one less thing to worry about before the big day. We are so happy for her and her fantastic results! 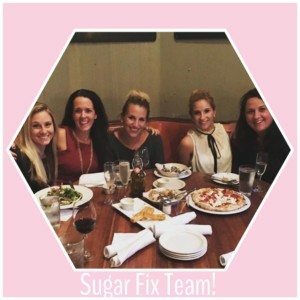 Can you tell who on the Sugar Fix Team has Invisalign braces on? There are two of us in the picture below wearing Invisalign clear braces and you can’t even tell! We all went out this week to our favorite neighboring restaurant Frasca for a fun dinner together after a great week of seeing patients. Dr. Emery and Ashley are finishing up their Invisalign treatment now and can not believe how quickly time went by! Dr. Emery is going to wear an upper retainer at night for the end of her treatment and get a lingual bar put on the bottom teeth. Ashley is going to have a Dawson’s night guard made. This type of nightguard is a retainer that holds all the teeth in place after Invisalign while also having a deprogrammer built in the front to prevent clenching/grinding. They are both happy with their treatment so far, and can’t wait to show you the before and after pictures! That’s it for this week, stay tuned for more before and afters!